I am one of those gods, those divine chiefs, who proved the truth-speaking of Osiris before his enemies on the day of the weighing of words. I am your kinsman Osiris. The Spells of Going Forth by Day (or Coming Forth by Day), commonly known as the Egyptian Book of the Dead, or simply the Book of the Dead, are ancient Egyptian funerary texts derived partly from the earlier Pyramid Texts and Coffin Texts, which were themselves used in creating the later Books of Breathing. One of the more famous examples of these works is the Papyrus of Ani. This is one of the most famous renditions of the set of spells and invocations known as "The Book of the Dead"
Homage to you, O you who have come as Khepri, Khepri the creator of the gods, you are seated on your throne, you rise up in the sky, illumining your mother Nut, you are seated on your throne as the king of the gods. Homage to you, O Bull of Amentet, Thoth the king of eternity is with me. I am the great god by the side of the divine boat, I have fought for you, I am one of those gods, those divine chiefs, who proved the truth-speaking of Osiris before his enemies on the day of the weighing of words. I am your kinsman Osiris. 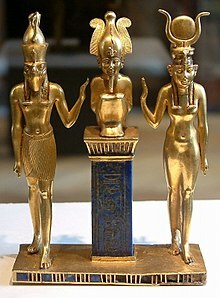 The heart of Osiris has in very truth been weighed, and his Heart-soul has borne testimony on his behalf; his heart has been found right by the trial in the Great Balance. There has not been found any wickedness in him; he has not wasted the offerings which have been made in the temples; he has not committed any evil act; and he has not set his mouth in motion with words of evil whilst he was upon earth. There is no sin in my body. I have not spoken that which is not true knowingly, nor have I done anything with a false heart. Grant you that I may be like to those favoured ones who are in your following, and that I may be an Osiris greatly favoured of the beautiful god, and beloved of the Lord of the Two Lands, I am Ra, who stablisheth those who praise him. I am the Knot of the god within the Aser tree, and my appearance is the appearance of Ra on this day. My hair is the hair of Nu. My face is the face of the Disk. My eyes are the eyes of Hathor. My ears are the ears of Up-uat. I am he who protecteth you for millions of years. Whether ye be denizens of heaven, or of the earth, or of the South, or of the North, or of the East, or of the West, the fear of me is in your bodies. I am he whose being has been wrought in his eye. I shall not die again. My moment is in your bodies, but my forms are in my place of habitation. I am "He who cannot be known." The Red Fiends have their faces directed against me. I am the unveiled one. The period when the heavens were created for me and were enlarged the bounds of earth, and multiplied the progeny thereof, cannot be found out. They shall fail and not be united again. By reason of the speech which I address to you, my name setteth itself apart from all things evil which are in the mouths of men. I am he who rises and shines, a wall which comes out of a wall, an only One who proceedeth from an only One. There is never a day that passeth without the things which appertain to him being therein; passing, passing, passing, passing. Verily I say to you, I am the Plant which comes forth from Nu, and my mother is Nut. Hail, my creator, I am he who has no power to walk, the Great Knot who dwells in Yesterday. The might of my strength is within my hand, I am not known by you, but I am he who knows you. I cannot be held in the hand, but I am he who can hold you in his hand. Hail, O Egg! Hail, O Egg! I am Horus who lives for millions of years, whose flame shines upon you, and bringeth your hearts to me. I am master of my throne. I advance at this season. I have opened a path. I have delivered myself from all evil things. Hail, my Lord, who dost hasten through eternity, whose existence is for ever, Lord of Lords, King of Kings, Sovereign, King of the gods, who live in their shrine. The Eye of Horus protects you, O Osiris Khenti-Amenti, and it keeps you in safety; it casts down headlong all your enemies for you, and all your enemies have fallen down headlong before you.